[I am working backwards through Amy Coffin’s 52 Weeks of Abundant Genealogy because I wasn’t paying attention at the beginning of the year. This is my entry for week #29…Organizational Tools. Here’s one of the things I learned from genealogy. Everyone has a method for organization that is the WAY THAT THINGS MUST BE DONE. The thing is not all methods work for everyone. What I learned is that you must find what works for you then implement it. 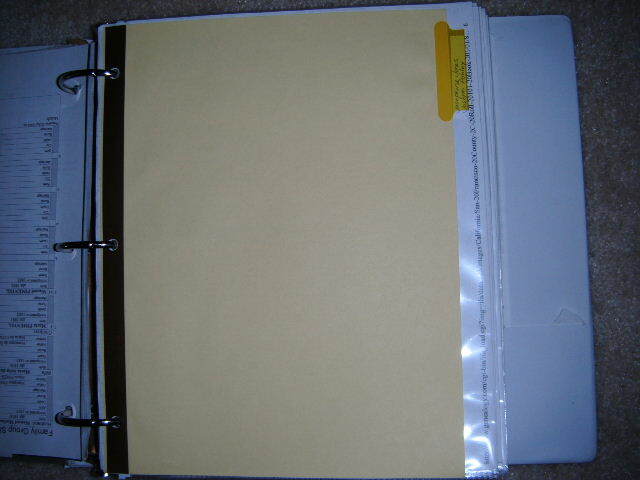 When I first started my family tree, I used file folders…lots of folders. I have a couple file cabinets full. The things is this I really hate working from file filders. Whenever you need something you can’t find it. You thumb through the papers in the folder and two always seem to get stuck together. Usually it’s the one you are looking for. They are inconvenient if you are doing a phone interview. You try to find the right folder and find the sheet of paper you need. You can never get it fast enough and you waste time that you could be taking notes. What I found was that I work better with binders. I have binders for each family group. 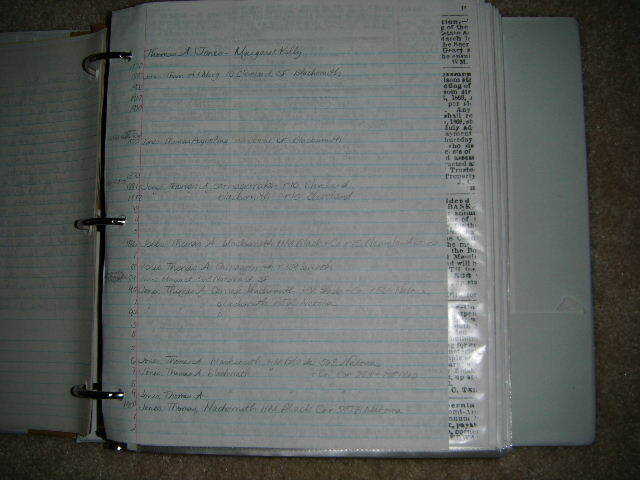 Each binder is divided by families with their descendants and their families behind separate tabs. 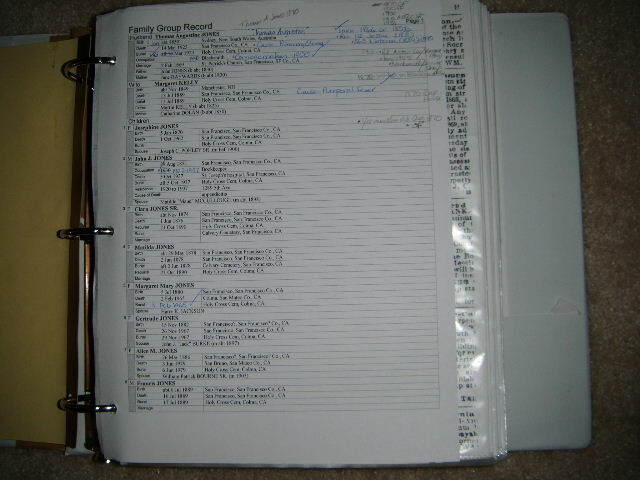 Each section has the documents, and notes that pertain to that family behind their family group sheet. Here are some examples of how I set them up. This is my Jones/Jackson binder. 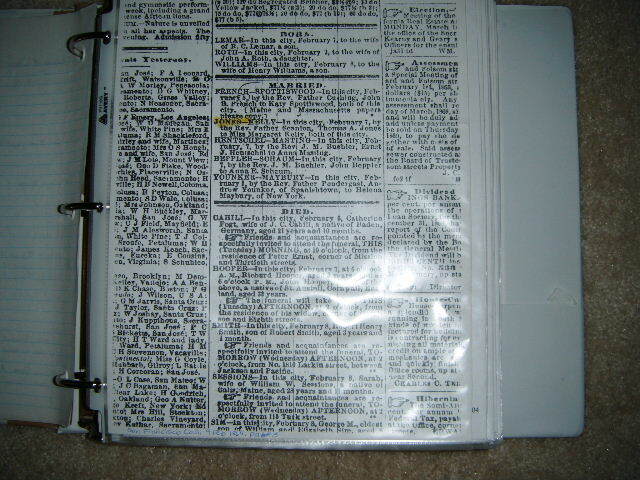 The next sheet in their section is research notes. This is the sheet I used to track their addresses when I was trying to sort out where the family lived. Behind the notes are copies of the documents. This way I can refer to them without trying to figure out where I put them. After Thomas and Mary, comes their first child, Josephine. I will repeat the same thing for Josephine. After Josephine, there will be separate divider for each of her children. What I’ve done to keep the generations straight is to use different sized dividers. Big ones for the main person and their children, smaller ones for the descendants. After Josephine’s line, there is a big tab for the next child of Thomas and Mary, their son, John. To make things easier on myself, there are different binders for different parts of the family. Mary Kelly and Thomas Jones parents and grandparents share a binder with the rest of the descendants of the line. The Portuguese side gets a bit more confusing because there are so many generations. Also, some of the families are huge. For the Jones and Kelly side, all the descendant lines fit into two binders. But, I couldn’t do this for the Pacheco’s. Each great aunt and great uncle has their own binder because the families are so large. The de Braga’s spread over many binders because they go back beyond 1400. The binders I use the most are in front of me and the rest are less accessible. I found that this method worked much better for me than to have a file folder for each family for their documents. When I make a phone call, I have the binder out and open to the family I’ll be working on. If the person asks me a question, I can easily see what I have. If it’s not there, I either lost it or don’t have it. I am hoping it’s the latter. My best advice is to find an organization method that you like, that is convenient for you, and fits your needs. You can do binders, folders, or a combination of both. You might even find a completely different method. Whatever way you choose, make it work for you!